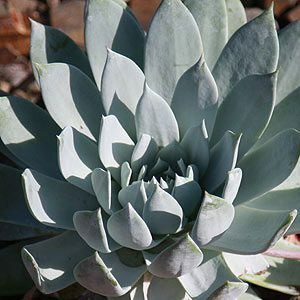 A group of rosette forming succulents from Mexico and nearby areas, with over 40 species, Dudleya offer variety for the collector and gardener alike. These are spring flowering plants, growing actively during the winter months, grown mainly for the foliage which varies in colour and shape. Flower colour varies from yellow through to red depending on the species. With the common name of ‘Live Forever’ they really are a tough little succulent in the right climate. These are a low growing group of plants, most species reaching less than .4 metre in height. They are evergreen, grow well in containers, and make great specimen plants in a contemporary landscape setting or mediterranean style garden. The most important factor in growing Dudleya species is a dryish summer period. In summer, these plants go into dormancy and do not require water during this period. Use a specialist succulent and cacti potting mix, if you are growing them in the ground, ensure good drainage. They grow best in a position where they are protected from the heat of the afternoon sun, and all species require protection from frosts. To avoid fungal problems and making the foliage it is better to water Dudleya from below the foliage. D. farinosa – This is a species with a very attractive powdery coating on the leaves. Sometimes called the powdery live for ever. 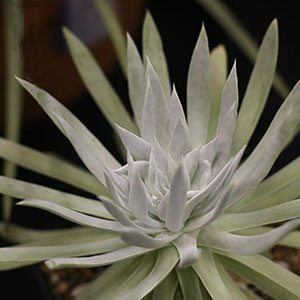 D. brittonii – With upright sticks of bluish foliage this plant is know as the Giant Chalk Dudleya. D. albiflora is a neat rosette forming species. The easiest method of propagation is by removing offsets. Leaf cuttings are also reliable. Propagation from seed is also possible. Over time, Dudley may form a stem which may become unsightly in some eyes. This can easily be remedied by removing the rosette with some stem and re rooting the cutting.